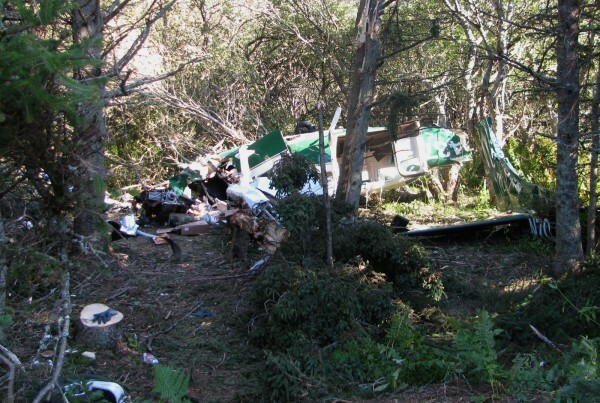 Over the weekend, the green and white Cessna remained where it crashed on Wednesday, leaving veteran Penobscot Island Air pilot Don Campbell dead. Islanders came to the crash site to leave flowers, flags and a cross for the pilot, whom many described as being "like family." MATINICUS ISLAND, Maine — Pilot error has been listed as a cause in two separate airplane crashes — one of them fatal — that occurred on this Penobscot Bay island two years ago, according to the National Transportation Safety Board. On Oct. 5, 2011, pilot Donald Campbell, 57, of Waldoboro was killed when he crashed the Cessna 207A at about 5:30 p.m. while attempting to land on Matinicus during gusty wind conditions. He was the only one on board. Campbell, flying the plane for Penobscot Island Air, had been delivering groceries from Rockland to the island. Islanders who rely on the air service as their “lifeline” to the mainland honored Campbell, citing his service and devotion to the community. The other accident occurred on July 17, 2011, when a Cessna 206G from Penobscot Island Air went down shortly after takeoff and crashed in the ocean less than 500 feet from shore. Four people were injured, one seriously, but were rescued by a crew from a fishing boat. The owner of the air service disputed that finding, however, saying that there was sufficient fuel according to company records. Knox County Regional Airport Manager Jeffrey Northgraves said that the terminology used by the NTSB in its reports is often stark with words such as “failure” and “improper,” but that in the October crash in which Campbell died, there was nothing the pilot could have done differently. The airport manager said a line of gusty winds moved through Rockland several minutes earlier and caused some wind damage in the city before traveling out to Matinicus. Weather readings from around Matinicus found that winds gusted to nearly 40 knots at the time of the crash, according to the NTSB. One witness, who was driving an all-terrain vehicle on Matinicus to meet the airplane, experienced a strong gust of wind with rain/sleet for about 60 seconds. After the second crash, Penobscot Air grounded its fleet for three days to try to determine if any issues needed to be addressed. Penobscot Island Air owner Kevin Waters said Friday that he had not yet seen the report concerning the October 2011 crash that was released Thursday. But in regard to the report issued on the July 2011 crash, Waters said he disagreed with the finding. The NTSB report on the July crash in which the plane landed in the ocean determined that the fuel selector was found in the right fuel tank position. When the airplane was recovered and the craft inspected, the right fuel tank was found to have only a pint of aviation fuel in it. The left tank had 27 gallons in it. Waters said he does not know how the NTSB determined how much gas was in the right tank before it crashed since it was ruptured in the impact and filled with seawater. He said that Penobscot Island Air is a small company and does not have the money to challenge the findings. The pilot told investigators that the airplane did not show any problems on takeoff from Matinicus which occurred shortly before 4:30 p.m. Weather conditions were good with light winds. When the plane reached an altitude of 200 feet, the engine began to lose power. He immediately advanced the throttle and turned on the auxiliary fuel pump with no results, according to the report. The engine lost total power and the plane ditched into the ocean. The four people aboard the airplane were able to get out of the plane before it sank. They managed to cling to a section of the plane’s belly cargo pod that separated during the impact. A search plane located the four at 5:24 p.m. and by 5:37 p.m., a fishing boat rescued them and took them to shore. The plane was recovered five days later. As a result of the crash’s findings, the NTSB said Penobscot Island Air implemented several changes to its operations with respect to monitoring fuel quantities. Water said the company agreed to suggestions made by the federal agency. He said the company already had its own system that followed those recommended rules but now everything was documented on paper. The NTSB also pointed out in its investigation that Penobscot Island Air had not provided the passengers with a briefing that there were life vests on board. “If a piece of wreckage had not been available for the passengers to hold on to, the failure of the pilot to notify the passengers of the availability of life vests could have increased the severity of the accident,” the NTSB concluded. Penobscot Island Air has since agreed to alert passengers before takeoff and offer them personal flotation devices. In the July 2011 crash, pilot, Robert Hoffman was credited with crash-landing the plane in the ocean in a way that avoided any fatalities. The passengers were Eva Murray, 47, of Matinicus; Abagail Read, 56, of Appleton; and Karen Ford, 53, of Waterville. Hoffman helped the three women escape through a front window of the plane, which quickly sank in about 40 feet of water and left the foursome clinging to the wreckage. An emergency beacon in the aircraft notified authorities of the accident and nearby fishermen Robert Young and Clayton Philbrook rescued the survivors, all of whom are recovered from their injuries. Waters said that the company has 14,000 takes offs and landings each year and has experienced, skilled pilots. He said they performed 183 medical evacuations from the islands in the bay last year. He said there is always an element of risk whether you are flying, driving or boating but that his crew has safety as its top priority.